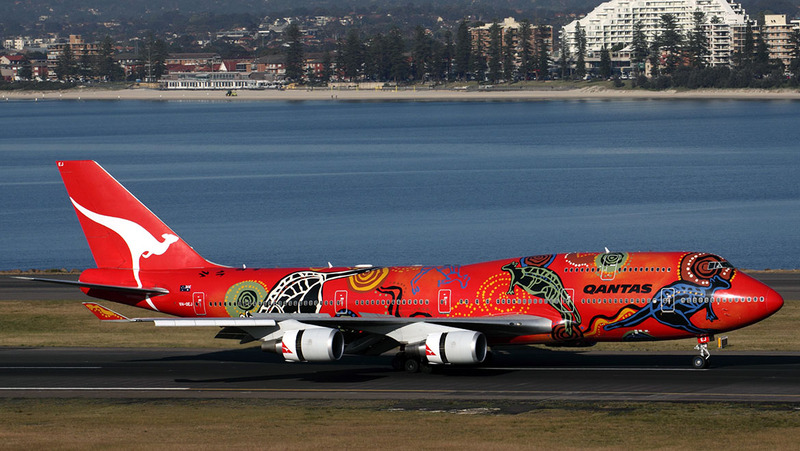 Qantas has begun the long goodbye for aviation’s most iconic figure, the Boeing 747. The finishing tape has been set for 2020, the year of the airline’s centenary. There will be much sadness, and much said, over the ensuing 30 months between now and when the 747-400 ferries its last passengers in Qantas colours. Nostalgia and sentiment are no match for the unrelenting march of progress however, and the pair holds even less sway among the number crunchers at Qantas’s Mascot headquarters. Hence Qantas’s decision in early May to exercise options for a further six 787-9s in order to be able to retire the last of its 747-400s. Qantas CEO Alan Joyce said there was some consideration given to upgrading the 747 to the same standard of cabin amenities on board the 787-9s already in the fleet and keeping them beyond 2020. However, the airline would have had to “spend a lot of money on reconfiguring them”. 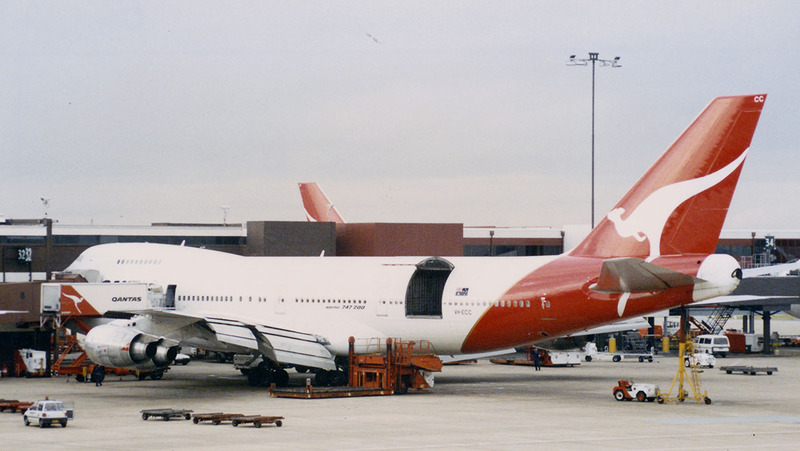 “So we made the choice of going for brand new aircraft and the business case works with even lower fuel [prices] than it is today,” Joyce told media at Qantas’s Mascot Hangar 416 while standing in front of 747-400 VH-OJU on May 2. “And certainly if fuel is higher, it really really works. Just three airlines now operate 747 passenger services into Australia – two foreign carriers and Qantas. Thai Airways flies the 747-400 between Bangkok and Sydney, while Korean Air uses the 747-8I at certain times of the year on Seoul Incheon-Sydney. For Qantas, the 747’s network comprises some medium-haul flights to Asia (Sydney to Tokyo Haneda and Hong Kong), a number of trans-Pacific routes (Sydney to San Francisco, Los Angeles and Vancouver and Brisbane-Los Angeles-New York JFK) and long over-water flights from Sydney to Johannesburg and Santiago. 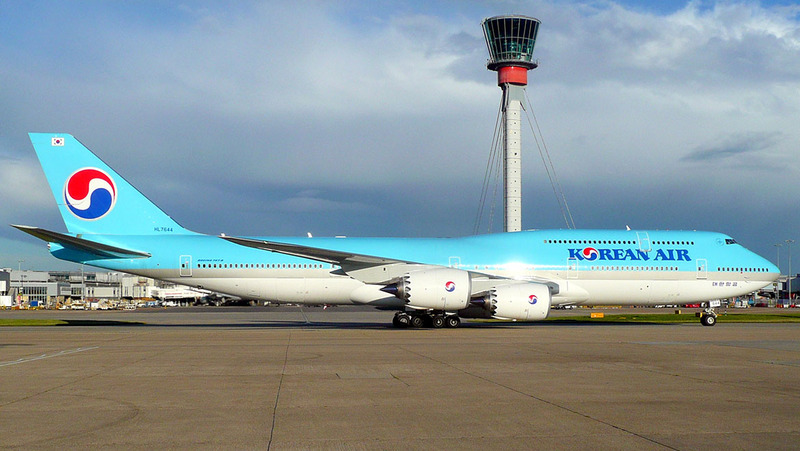 It currently has 10 747-400s in service, comprising six GE-powered 747-438ERs (VH-OEE thru OEJ) delivered between 2002 and 2003, a single GE-powered 747-48E (VH‑OEB, built for Asiana in 1993 and acquired by Qantas in 1998) and three Rolls-Royce-powered 747-438s (VH-OJS, OJT and OJU) delivered in the 1999-2000 timeframe. 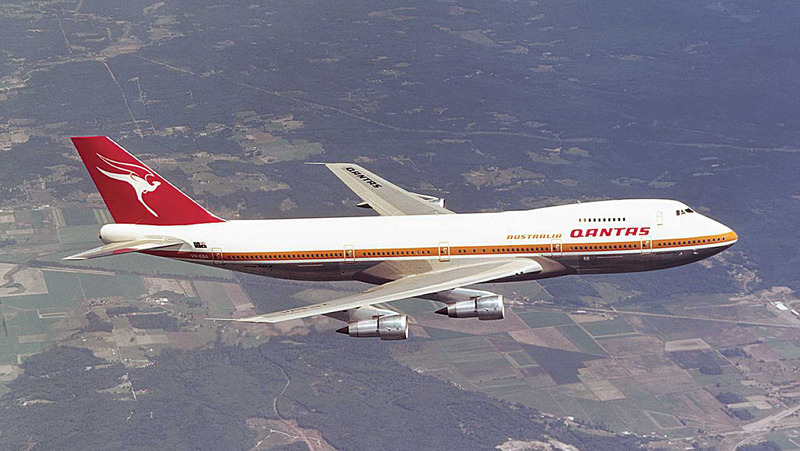 Qantas’s relationship with the 747 dates back to 1967, when it first ordered four 747Bs. The first of these entered service in September 1971, and in time the airline would operate almost every major 747 variant, including the 747SP, the 747 Combi, the 747-300 (which introduced the extended upper deck), the 747-400, and the 747‑400ER (Extended Range). 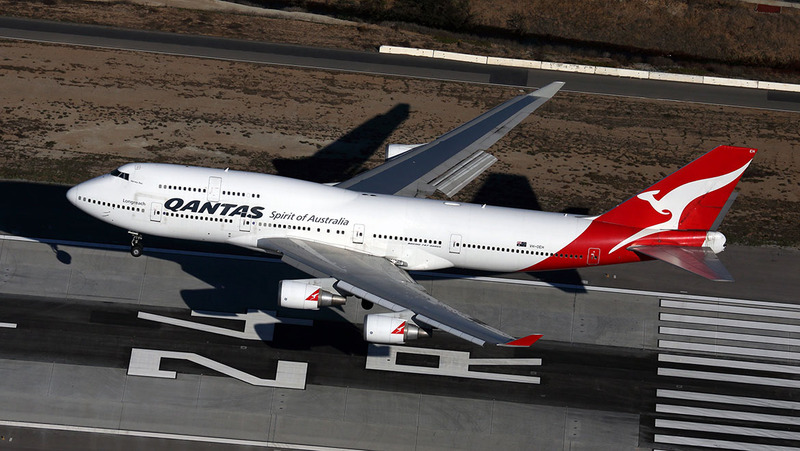 In all, Qantas has operated 65 747s, taking delivery of 57 new 747s from Boeing, purchasing three 747‑400s secondhand and operating five leased aircraft at various points. And for a period between the retirement of its last 707 in March 1978 and the delivery of its first 767 in July 1985 Qantas even operated an all-747 fleet. Joyce said the 747 helped democratise air travel. “The 747 for us, it has been part of our history and it has been an amazing aircraft for the Qantas Group,” he said. “For probably most Australians, it is the aircraft that they’ve used to experience their first trip overseas and for immigrants coming in here, it is probably the first aircraft that they came and experienced Australia on. The 747 in Qantas service also has a significant place in the history books too – in 1974, the airline set what was at the time a world record when it carried 673 passengers out of Darwin after the city was savaged by Cyclone Tracy. For the several hundred Qantas pilots currently flying the 747, confirmation the airline planned to retire the fleet by 2020 has set a deadline of sorts to decide on where they go next. Qantas 747 Second Officer Michael East said he was in no hurry to say goodbye. East, who was among the four pilots to ferry 747-400 VH-OJA from Mascot to the Historical Aircraft Restoration Society (HARS) at Illawarra Airport in March 2015 alongside Captain Greg Matthews, Captain Ossie Miller and First Officer Peter Hagley, has been with Qantas for 13 years, all of those on the 747. “I grew up wanting to be a 747 pilot and we know the day is inevitable it is going to be retired but it is very sad to know that there’s a definite date on it now,” East told Australian Aviation while sitting onboard VH-OJU in Hangar 416. “It has been a dream of mine to fly this amazing, iconic airplane and in recent times I have become an instructor on it as well so it has been really enjoyable training new pilots to fly the 747. Asked what aircraft type he might opt for next, East said he hoped to be able to stay flying on long-haul routes. “I love all aeroplanes so it is not such a big deal for me to go one over the other. I’ve got a couple of years to work it out,” East said. “I love the long-haul flying so that will be most likely the 787 or the A330. Joyce said the 787-9 top-up order would result in an increase in pilot jobs. “We will need more pilots with the more flights that we are doing with the smaller aircraft,” he said. The decision to exercise options for an additional six Boeing 787-9s to arrive between late 2019 and mid-to-late 2020 will bring to 14 the number of the type in the fleet. Meanwhile, the 747s would be steadily retired from July to the end of 2020, with the last of the type to be gone by the time Qantas celebrates its centenary. “Qantas has renewed itself over the decades. It has seen the flying boats replaced by the 707s, which was also a major moment. The 707s were replaced by the 74s and now the 74s replaced by the 78s,” Joyce said. “We are looking forward to our second century with a new fleet, a new product, aircraft our customers will love, our employees will get great benefits out of, so a very exciting moment for the Qantas Group. Currently, Qantas has four 787‑9s which are used to operate a Los Angeles-Melbourne-Perth-London Heathrow rotation. It has four more on firm order due to arrive by the end of 2018, which will be based in Brisbane and replace the 747 on Brisbane-Los Angeles-New York JFK . Qantas said the additional six 787-9s would feature the same cabin configuration as the Dreamliners currently in service, with 236 seats comprising 42 in business in a 1-2-1 configuration offering direct aisle access for every passenger, 28 in premium economy laid out 2-3-2 across and 166 in economy in a 3-3-3 layout with 32in seat pitch and 17.2in seat width. By contrast its 747-400s have 364 seats comprising 58 SkyBed seats in business, 36 seats in premium economy and 270 in economy. 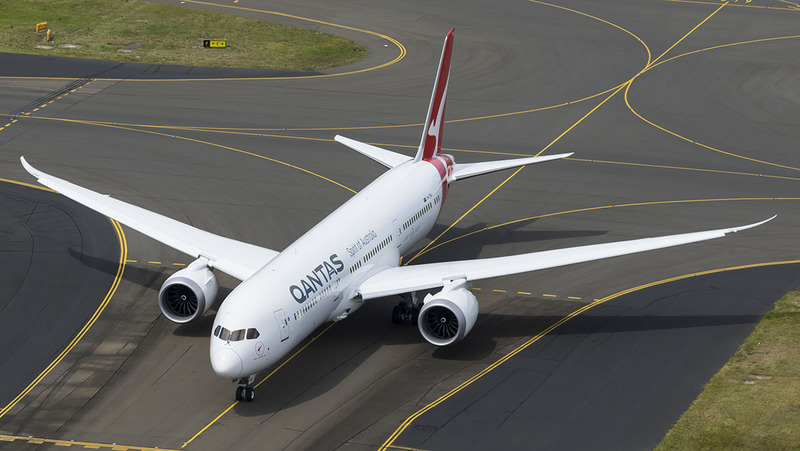 Despite the reduction in seat capacity, the airline said “the reduced maintenance needs of the 787 plus more efficient aircraft patterning and reduced payload restrictions on long routes mean the actual impact on overall capacity for Qantas International is expected to be negligible”. Joyce put the reduction at about three per cent. “We will actually be doing more flying with these aircraft and more flying with other aircraft,” Joyce said. “This allows us to do different routes and new routes and more frequency on routes that we have today. No decision has been made on where the additional half-dozen 787‑9s will be based. “We’ve got four aircraft based in Brisbane, four in Melbourne and we are looking to put some of them in those locations and in Sydney. We are talking to the airports and the states about where they will end up,” Joyce said. Further, Joyce said the 787-9 has been “spectacularly reliable” since it began operations in Qantas colours in November 2017, giving the airline the confidence to order more of the type. “That five or six months has been really key. It has given us an indication that the reliability of this aircraft is really good,” Joyce said. In 2020, the airline will join an already lengthy list of carriers who have retired the 747. In 2017, US major carriers Delta Air Lines and United ended 747 passenger service. Air France and Cathay Pacific said goodbye in 2016. Air New Zealand and All Nippon Airways retired their last 747s from passenger service in 2014, while Singapore Airlines farewelled its 747 passenger aircraft in 2012. An analysis of the 747-400 fleet from aviation thinktank CAPA – Centre for Aviation noted there were 505 747s in service as of the end of April. Of those, more than half (282) were freighters, while 212 were passenger aircraft. There were also 11 747 combi aircraft – which carries both passengers and freight on the main deck – still in service. VIDEO – A Qantas television ad celebrating the introduction into service of the Boeing 747-400 in 1989. “This concentration of freighters among the currently active 747 fleet is much higher than the freighter share of 40 per cent of all 747s that have ever been delivered, reflecting the trend for cargo aircraft to have longer economic lives,” CAPA said. While aircraft storage facilities in the deserts on the United States west coast or Alice Springs closer to home may be the final location for the Qantas 747 fleet, some aircraft may be sold and have a second life as converted freighters, or as exhibits at aviation museums such as the 747s already on display at the Qantas Founders Museum at Longreach and at HARS in the Illawarra. IS THIS THE LAST 747 PASSENGER AIRCRAFT TO BE DELIVERED? In August 2017, 747-8I MSN60411 and sporting registration HL7644 was delivered to Korean Air at Boeing’s Everett final assembly line. It was the 47th 747-8I to have come off the production line. It could also be the last ever passenger variant of the famous jumbo to be built. There are no outstanding orders for the 747-8I. Indeed Boeing’s 2017-2036 Current Market Outlook was the first not to separate out the medium widebody (300 to 400 seats) and large widebody (more than 400 seats) segments. Essentially, Boeing has stopped giving a forecast for the very large aircraft (VLA) segment. It traditionally regarded the VLA segment, featuring the likes of the Boeing 747 and Airbus A380, as a small market, believing just a handful of airlines around the world had the route structures and capabilities to successfully utilise an aircraft with more than 400 seats. “The 748 is not going to be a passenger airplane anymore, at least from a sales perspective,” Boeing Commercial Airplanes’ vice president of marketing Randy Tinseth told Australian Aviation on the sidelines of the Singapore Airshow in early February. “We’re just focusing on either VIP operations or on freighters. Boeing’s 777-300ER consumes about 15 per cent less fuel per seat kilometre on long-haul routes compared with the 747-400. Then there is the added savings of having to maintain just two engines and not four, as well as lower maintenance costs generally. In times where fuel prices have been creeping up – although still well below the near-US$150 a barrel peaks of 2008, crude oil prices reached their highest levels in more than three years in April – and single-digit margins, those savings are impossible to ignore. At April 30, Boeing had delivered 1,547 Boeing 777s since the program was launched in 1994. Meanwhile, the 747 delivery count stood at 1,544, meaning the 777 had become the most delivered widebody aircraft in the history of aviation. “With the 777 having 485 outstanding orders (mainly for the newer generation 777-9 and 777-8), compared with 42 for the 747, the reign of Boeing’s double-decker widebody is well and truly over,” CAPA wrote in April. To further illustrate the point, CAPA noted Airbus’s A330 could also overtake the 747 in the coming years, given the program has delivered 1,402 A330-200, -200F and -300s and has outstanding orders for 300 more aircraft, including 214 for the A330-900neo. “This indicates that the 747 will be pushed down into third place behind both the 777 and the A330 in the next two to three years,” CAPA said. There seems no way back for the 747, given the ever growing number of the type being parked in the desert to be scrapped. However, the Queen of the Skies’ place in aviation history is well and truly assured. “Jumbo the Elephant popularised the term ‘jumbo’ in the 19th century as a description of anything large,” CAPA said. This feature article first appeared in the June issue of Australian Aviation. To read more features like this, subscribe here today! Come 2050, and I guess there might be perhaps just a few 747s still flying around as freighters. It has a truly well deserved place in Aviation History. Tickets will be very scarce for the last flight, remember when the Jumbo was the only Jet flying under the Flying Kangaroo. Yes,my wife and I have travelled on 747-400’s many times to LA and the 747-200SP to Manila prior to its withdrawal of service,most recently we have travelled to the USA on the A380’s with a very smooth flight we also travel on the A330-200’s & 300’s to Manila frequently,yes we will miss the queen of the skies when they do retire,one such retirement was the 1st 747-400 that Qantas has is now a museum exhibition at HASS at Albion Park south of Sydney,where we witnessed history being made when it landed on a runway not very long in distance but with a great crew on board they did it. No, this is NOT correct. Why don’t journalists these days do proper research??? 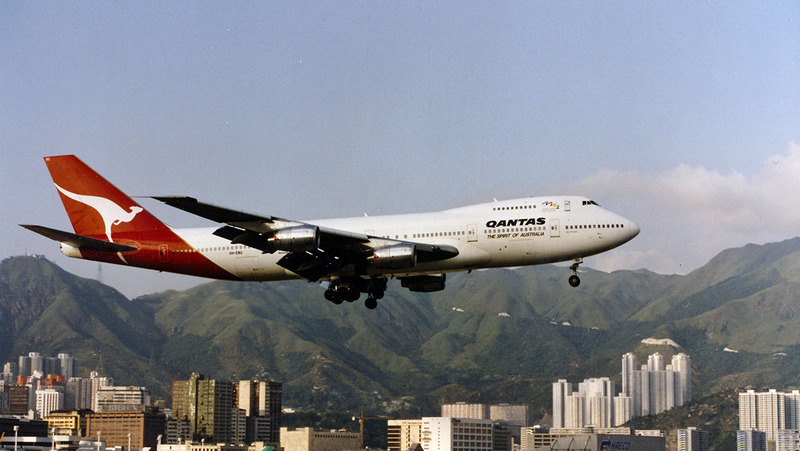 Qantas ordered the 747-100 (would have been a 747-138) but when the ‘B’ model was announced, Qantas switched its initial order for 100 series (x4 aircraft) to the 747-200B (-238B) instead. 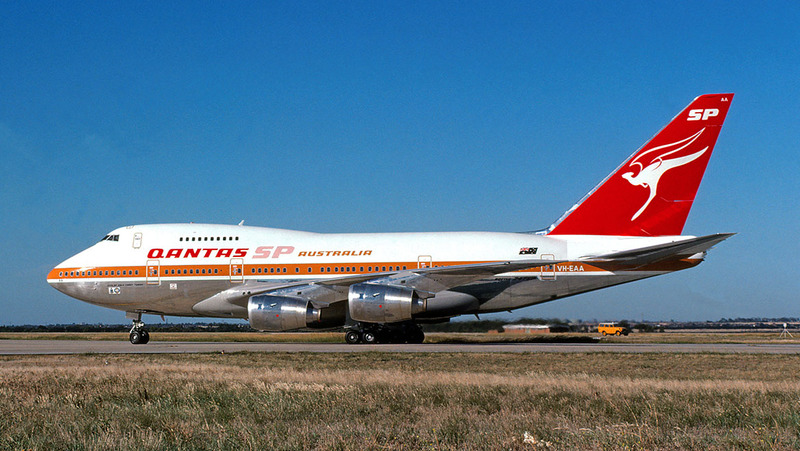 The -SPs were slots on the production line offered to Qantas when the sanctions were placed on Iran after the 1979 hostage taking, the spots on the line were originally to be 747-SP-86s but were manufactured as 747-SP-38 when Qantas took the spots over. The last 707-338C was retired in 1979 NOT 1978 – the last flight was from Wellington to Melbourne – these facts are not hard to find, which is seriously sad when an article like this about such an iconic aircraft is riddled with mistakes. Does Alan Joyce’s comments about “2 engines good, 4 engines bad”, mean that the A380 is on its last legs with Qantas too? Could be! And given that the B747-400ER flies the Sydney-Joburg and Sydney-Santiago trips on the southern great circle route (almost reaching the Antarctic continent in the process) will the B787-9s be forced to take a more northerly route, because of ETOPS and all that (esp with the current furore over the RR Trent engines)? I’m reading this a few months later, but Qantas has cancelled their options on further A380s and stated that they won’t be buying any more. That said, they’ve got about 15 years of life left in them so last-legs is a bit of a stretch. I admit I’m not sure sure about the ETOPS issues with the 787s, but as they’re sending A350s over the north-pole these days I’m wondering if the regulations have changed. LAN do the flight with 787s but I’m not sure of the route. If someone knows I’d be interested. I remember my first B747 flight. As an unaccompanied child flying from Port Moresby to Sydney in 1977. Qantas upgraded me to First and in those days the lounge upstairs was still open. Fond memories as I was invited into the flight deck and was well taken care of by the crew. What a great aircraft the 747 is I will really miss it. Please paint a couple in retro schemes before they go. YES WE WILL ALL (EXCEPT THE ACCOUNTANTS) BE SORRY TO SEE THE 747 LEAVE QANTAS SERVICE AND THE REMAINING AIRLINES. HAD MY FIRST FLIGHT IN ONE IN JULY 1971 PANAM LAX/LHR AND MY LATEST IN 2014. FORTUNATE TO HAVE ALSO HAD MANY JUMPSEAT TRIPS IN THEM, A MAGICAL FLIGHT DECK. THE 747 STILL TURNS HEADS WHEN IT APPEARS, THERES NOTHING QUITE LIKE IT. I flew over 13000 hours as a pilot on 200,300 and 400 series 747. An aircraft that was so nice to fly, so reliable and redundant systems that never let you down. My memories of this Queen will always be treasured and she will be sadly missed. 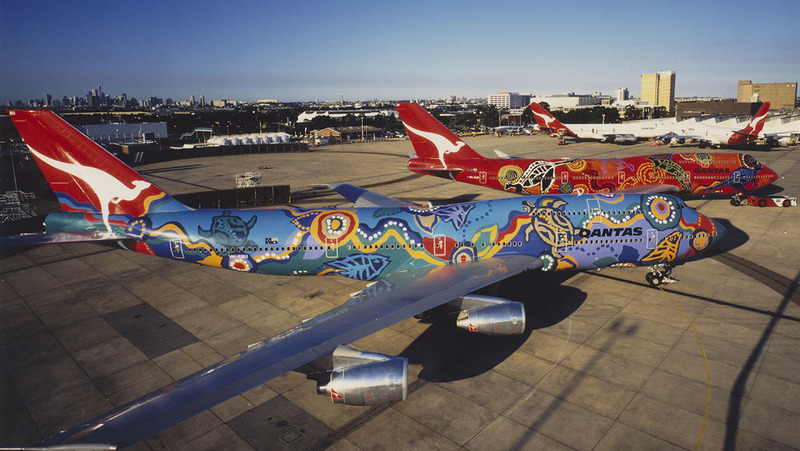 I remember the day I, with the help of others that I took that photo of the 2 aboriginal painted aircraft, we used a Qantas cherry picker at max height for the job. Both aircraft were in for maintenance at the same time “very rare”, so just prior to one aircraft being towed to the SIT to commence it’s service we positioned the cherry picker near Lake Gaunt and took the shot, I still have the original negative somewhere!! I have not seen any other photos of these two aircraft side by side. Alan Joyce why not on the day of the airlines centenary, have the last 747 leave then – with those who worked on the 747 form a guard of honour to this mighty revenue raiser for Qantas???? Love the photographs accompanying this feature. Sad to see such an iconic aircraft withdrawn from revenue service. Hopefully the remainder of the fleet wont end up in a dismantlers yard. Another life converted to freighter might be considered. Possibly one could be preserved as a flying museum exhibit. Atlas Air also operate B747-400 (ex JAL frames) passenger aircraft into Rockhampton on military charters, operating two flights here in June for Operation Hamel. This military operation continues yearly, so we should see these flights continue for a bit longer. Wasn’t it amazing how the 747 looked immediately dated the moment the A380 touched down? Credit to Qantas for upgrading the interiors of their 747 fleet, putting the new style business class seat from the A380 in some of the 747s. But, the fleet was tired and old – I took a flight to JNB on QF63/64 December 2017 – I made a comment to the cabin crew member about the age of the aircraft and he replied: “not only that, this is the oldest one we have c1989” or something like that! Imagine the metal fatigue!! I was a little concerned! It could be worse – imagine being ‘rescued’ by a Royal New Zealand Air Force Hercules, approaching 50 years old – and expected to remain in operation until 2025. I think I would take my chances and remain on terra firmer! (and the more firmer the less terra). Yes but the Kiwi Hercs have had their winds rebuilt plus new avionics – I was in an AirNZ B777-300 taxying out & saw a Qanta B747 taxing as we turned onto the runway & marvelled at how impressive & unique the Jumbo still looks. Would be good to see more airlines operating the 747-8 which is a superior machine using 787 engines & wings. Just flew on the final Quantas 747 flight from Brisbane to LAX yesterday Sept 22nd. Felt bad for the pilot and crew, but everything always comes back to the almighty dollar. I have flown to London 16 times from memory, 14 of those with the Kangaroo, only once by 707. The seats I chased, 70,71,72,73, A,B,J&K. Qantas staff are exceptional!! Love that reliable old Jumbo! !